Working with animal Reiki is one of the most rewarding things I have ever done, aside from teaching animal Reiki to others. When I work with animal Reiki, I always feel that I am being taught very deep soul lessons. The animals teach me, and the Universe and Nature teach me through the animals. I have learned things about the world and about myself through animal Reiki that are beyond words and are not available in books. Furthermore, had I not experienced these things for myself, there is little likelihood that I would have believed them. Working with animal Reiki allows us to remember the connection we have to the Divine and to Nature. We tend to forget that connection as we get older and become adults. This simple practice offers us a way to remind ourselves often and to renew that sense of childlike wonder and awe that we once had. I am grateful for the endless ways there are to practice animal Reiki. Since animals of all types are pretty much everywhere, there are many opportunities to find ways to connect with them that work for each of us. There is no reason to limit the way you think of animal Reiki. Animal Reiki practitioners work in a number of ways, not just in shelters. Some even work quietly, behind the scenes in their own neighborhoods. Each time you connect, you grow and you make a difference. 1. Work with pets and other animals in their home, at their farm, or in their stable. 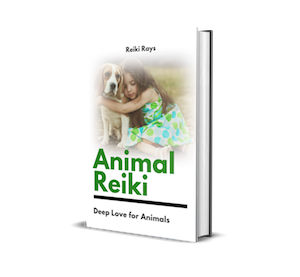 As more and more people are becoming aware of the benefits of Reiki and see how much help it is for them or their friends, they look to Reiki to help their pets. Reiki has helped many of my animal clients with issues such as anxiety and overcoming trauma, as well as the resulting behavioral problems that often stem from those issues. It has also been very helpful in easing the difficulties from cancer treatment, such as pain or nausea. And Reiki is a wonderful comfort for both pet and human when it is time to transition over the Rainbow Bridge. It seems to bring a gentle sense of calm and peace that allows for an easy and gentle transition. 2. Work distantly with pets or other animals. This category can actually encompass many ways to work with animal Reiki. You can work with animals at a distance in any way that you might work with them in person. In some cases, you may be able to work with them at a distance when you cannot possibly help them in person, such as for a seriously hurt wild animal or a lost pet. Distant Reiki is often most comfortable for the animal and many practitioners find it less distracting to work this way, even for animals that could be treated in person. Having done hundreds of animal Reiki sessions distantly, I can assure you that the benefits are just as wonderful, even from across the world, as they are in person. Animals are much more receptive to Reiki than humans are, and for this reason, there is no resistance or doubt. They simply receive and the healing begins. 3. Volunteer in your local shelter or animal rescue. This a great way to get practice and to help out in the community and many practitioners are drawn to it. However, some practitioners feel as if they must volunteer at a shelter or rescue in order to be an animal Reiki practitioner. Yet, shelters aren’t for everyone. They can feel very overwhelming to some, either on a sensory or emotional level. If you want to work with animals, but don’t feel comfortable in the shelter, please don’t feel as if you have to do this. Choosing to work with animals where you feel comfortable will be best for you and for the animals. 4. Volunteer at a zoo or a wild animal habitat. This can be a very interesting way to work with animals and to get practice. It is very expansive and grounding to work with very large wild animals and reptiles, in particular. It takes special training to know how to work safely around most of the animals, and your zoo will help you with that. If you choose to do animal Reiki on your own at the zoo, please do it from outside the enclosures. Never enter an animal’s enclosure without permission and special training. 5. Work directly with the animals in your neighborhood, or your own yard. There are wild animals, birds, feral cats or dogs, and insects in your own neighborhood—even in the city. Most of us have the occasional insect or spider even in our home. These are wonderful opportunities to connect with the smallest creatures of the world. When you do this, you will begin to recognize the Divine Life Force in even the tiniest thing—seeing the God in everything. Simply go outside and offer Reiki to the plants, the trees, the soil, the air, the birds—anything that wishes to receive. You can also do this practice as you go on walks or hikes. This is a wonderful way to be of service and to expand your own growth and learning through animal Reiki. 6. Last but not least, treat your own pets! There is no better way to work with animal Reiki than by increasing the bond we share with our own animal family members. Sharing the joy of unconditional love through Reiki is amazing. You don’t need to wait until your pet is sick to do Reiki with them. These are some suggestions, but you may have many more ideas. Let your imagination open you to the ways to connect with animals! I would love to hear your thoughts in the comments about how you like to practice animal Reiki! Amazing.. Offering Reiki to animals and plants is the best feeling.. ? I am wondering where is the best way to position your hands when healing an animal. My cat will not stand still and when laying down, he will only lay on one side. I am trying to do my best to feel his chakras but I don’t want to stress him with a session. He has been calming down little by little but at 3 years old still retains a strong feral psyche. I have not done anything to him such as removing any parts — he is not troublesome in bad habits at home. he is very clean. I just would like to reiki him to feel less anxious when other people come to my home. I am not sure how to gain approval from an animal to reiki! any advice you may have would be welcomed. I have my Level 1 reiki and will receive Level 2 in about 2 weeks. Thank you I found this really interesting and informative Many Blessings ?? Thank you for your kind words! I’m so happy you found it helpful. Blessings. I’ve found with animals, they simply come & remain near me until they have had enough reiki. I don’t touch them unless they initiate. That’s perfect, Karen. Some are fine with being touched right from the beginning and others want hands on later in the session, but it is best to let them guide you. I like to send reiki to the sky and clouds when the chemical clouds have been sprayed in the skies. I imagine sending healing colors to the clouds and also around and inside the planes that are spraying chemicals. Which ever chakra or archangel color comes to my mind first is the color I send. I imagine the liquid chemical tanks in the airplanes changing to the color I am sending so when they spray the chemicals they will actually be spraying healing energies instead of harmful chemicals. I love doing this and it works. The chemical clouds disappear in a couple of days and we have clear skies and beautiful white fluffy clouds again. I hope more people will do this with me. ❤️ Blessings to you all in your Reiki giving. My cat has been getting Reiki since she was 8 weeks old and I have attuned her to Master level. I loved this article. thanks Angie. I understand exactly what you say. Sometimes moths and other insects that have been trapped inside the house come to me to be let out. But there are times when I initiate the move, the moth dives away and hides itself. I guess even tiny parts of life have free will too. I like to send distance Reiki to animals that have been killed on the road…and road accident sites to clear the energy at that place of its negative destructive attraction. Thank you so much for sharing your experiences, Heather! I find it all so lovely and every small thing we do heals all of us. The only issue I have with this article is the term ‘animal reiki’. Reiki is reiki wether on a person, plant animal or object. To keep using terms like this will amend people feel they need attuned to ‘animal reiki’ and be scammed into paying for attunements they do not need. Hi Juliet, You are correct that there are no further attunements needed in order to practice animal Reiki. However, treating animals is somewhat different than treating humans, for many reasons. It is a focused specialty, much like there are various specialties within the field of massage or other healing practices. For that reason, some people prefer to take an animal Reiki class to learn this specialty and the ways to best practice it. I can’t speak for all animal Reiki teachers, but I offer my animal Reiki classes primarily to those who have already been attuned to Reiki and offer no new attunements. Others teach animal Reiki along with their regular Reiki classes and offer all the attunements that come with any Reiki training. Hope that brings some clarity and eases your concerns. Thank you for the inspiring article! Love Light! ? ? I meant to say Love and Light ?? I volunteer reiki at my local dog shelter and find it very challenging! They get me to work with some really high strung dogs and getting them to relax is a world away from going to somebody’s house and offering reiki to their dog! Very nice article thank you madam. I have my pet named Jaspar of Boxer breed malevof 2 years old. As I work out of town one month ago I asked my son for a video chat and noticed my pet just standing and I asked my son the reason. He said that last two days it is not eatiing or drinking water not sitting or sleeping. He thought may my pet searching his mother as it is missing for a week as she was out of town. After noticed I started to give Reiki to my pet. Mean time my son took thecpet to vetnery doctor he examined and given some medicine but not recovered.After 3 days he took the pet to government vertinery hospital there they given medicines injection and glucose saline as it was very weak. After 4th day they collected blood sample as the pet could not stand and laid down. Doctors analysed that kidney problem and also having heart problem and due to that it could not walk. Meantime daily I sent Distant Reiki treatment and started to drink little and eat also. After a week time, second blood sample collected and doctors said that kidney problem solved but declared that it could not walk for life time . It is still in bed passing urine and motion and we clean and bath it every time. Healthy eats well but could not move or walk. Still I have hope through Reiki treatment I could heal him by the help of Reiki. Any treatment method please let me know for fast recovery of my pet Jaspar. Your advice and help is needed. My friend is a reiki master as am I. I use reiki when needed or drawn to use it on my animals as they are all older and most likely suffer from arthritis. My friend on the other hand tried volunteering at a shelter and it just wasn’t for her. So instead she volunteers for the shelters foster program for baby kittens. She takes them in provides all that is needed warmth love food human contact… and of course reiki. She loves it and it gives her a reason to wake up in the morning. She’s 71 and at that age she says there really isn’t much left to give her a drive in life but she has this. She also has a dog of her own and an adopted foster cat from her first litter she fostered. She uses reiki on them regularly. It’s a wonderful connection we can accomplish and it always seems to smooth the animals until of course they have had enough and then often will pardon themselves from your prescense letting you know they have had enough. Happy trails to all hope you all find a path that is right for you. I am a Reiki Practitioner for animals and where I live there are not that many people interested in Reiki for there pets. They push giving this oil more for their dogs and cats. Now mind you…..this may be beneficial BUT….. for a traumatized animal. I tend to differ. I have worked with a friend’s horses in the past and I was amazed at how receptive they were. In fact, reiki began flowing as I stood next to one of them and I didn’t know why. She told me later that he suffers from a congenital spine deformity which requires manipulation by a physio. I have him reiki as the physio worked on him and he fell asleep! That was my first encounter with animal reiki and since then I’ve given it to my wee diabetic cat. She now lays still when I do. I’d love to do more and reading your article had given me more ideas. Imagine sending reiki to a wee ladybird or spider? !